- This story was later adapted by Thomas Rickman into a television movie (directed by Mick Jackson), which aired on 5 December 1999 and starred Hank Azaria as Mitch and Jack Lemmon as Morrie. 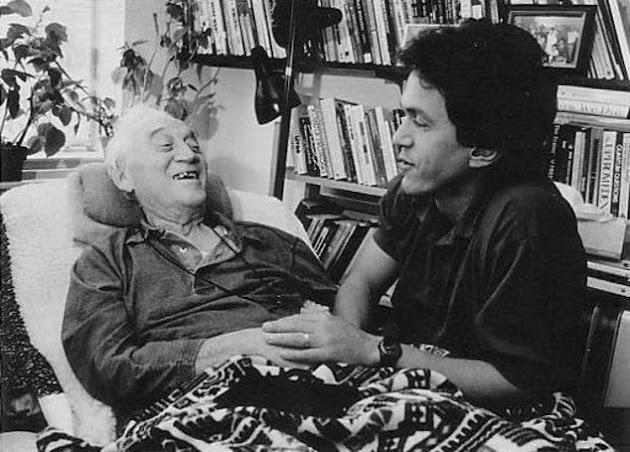 - This is a true story of Morrie Schwartz and his relationship with his student, Mitch Albom. - Before Albom was a household name, he was known on the comedy circuit as the warm-up act for Gabe "Welcome Back Kotter" Kaplan. - Albom is an enthusiastic philanthropist, having founded two charitable programs, the Dream Fund and A Time to Help. Life definitely has something to offer... should they be good, happy, tragic, lonely or bad, it all depends on one's perception in life. One might see good things that come up from bad experience for that is his perception or a happy person may find life bad for he may see something bad around him. It all depends on our perception. Take the following story for example: that no matter how challenging life is one may be able to find happiness, contentment and friendship. Maybe it was a grandparent, or a teacher. Someone older who understood you when you were young and searching, who helped you see the world as a more profound place, and gave you advice to help you make your way through it. For Mitch Albom, that person was Morrie Schwartz, his college professor from nearly twenty years ago. Maybe, like Mitch, you lost track of your mentor as you made your way, and the insights faded, and the world seemed colder. Wouldn't you like to see that person again, ask the bigger questions that still haunt you? Mitch Albom had that second chance. He rediscovered Morrie in the last months of the older man's life. Knowing he was dying, Morrie visited with Mitch in his study every Tuesday, just as they used to back in college. 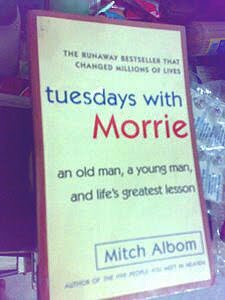 Tuesdays With Morrie is a magical chronicle of their time together, through which Mitch shares Morrie's lasting gift to the world. This moving tale makes us realize that there are things in life that we easily take for granted. All we see are the negative side of life leaving the good things easily forgotten... The story has touched millions of readers, not only because of the beautiful plot, but also because of the author's superb skill in writing as well. Published in 30 languages in 34 countries, the book remains an international bestseller.